It's live! 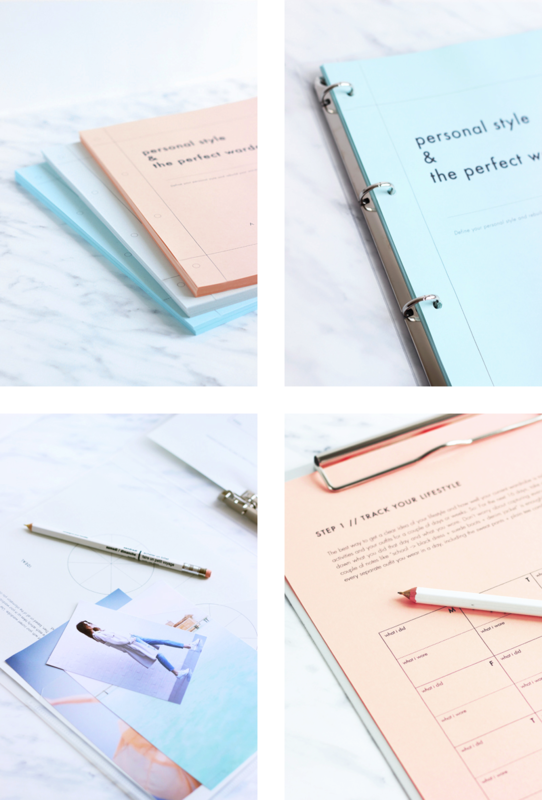 “Personal Style & The Perfect Wardrobe // A Workbook” is now (finally) ready and available! Thank you all for your lovely words and encouragement during the last couple of weeks. It really helped me push through the final stages of editing! As promised, the workbook will be 20% off (16€) for 24 hours, that means all of today and until 3pm CET tomorrow (9am ET). Edit: Launch day was on August 5th, the sale is now over. Click through to the official workbook page or on the button below to buy the workbook directly. Below you'll find some more sneak peeks and also a couple of tips for organizing and customizing your workbook. I know most people in the US and Canada will only have access to printers that print on letter-sized paper as opposed to A4, so I created two versions of the workbook: one in A4 and one in letter-size. You'll have access to both after paying, so download the right version for your printer and then print the PDF at 100% and, if possible, using relatively thick paper. You will have to shuffle the pages around a lot while you complete the steps in the workbook, so the sturdier the pages are, the better. 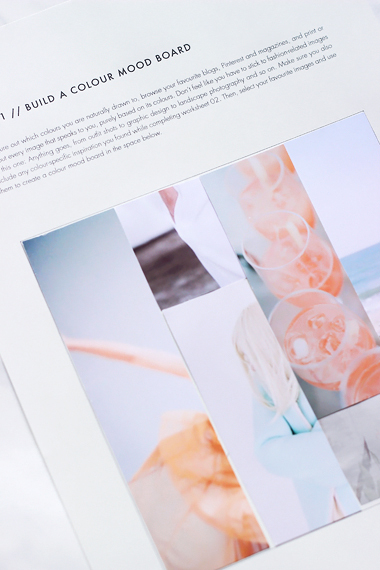 The workbook comes as a black & white PDF file, which has a definite minimal flair to it on its own. 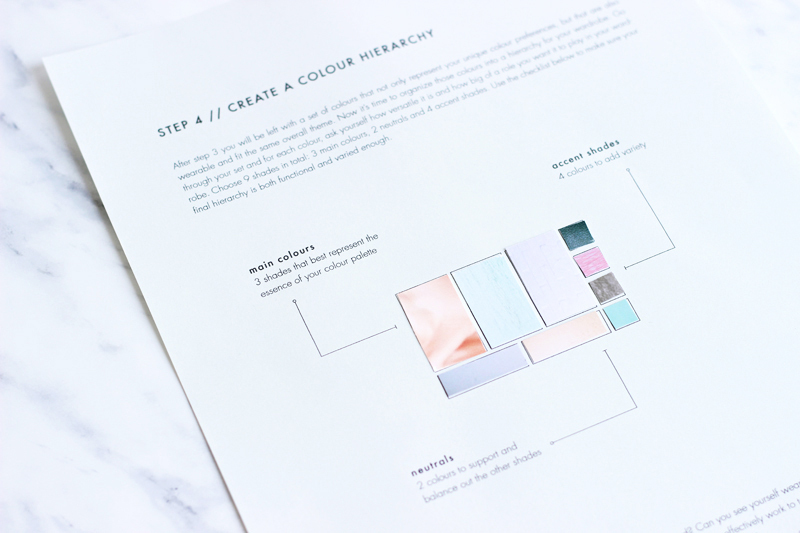 If you want to customize it, your easiest option is to simply print it on coloured instead of white paper, like I did for the samples in this post. Feel free to go crazy colour-wise but steer clear of dark shades, to keep the text easily readable. Print out a single test page first, if you are not sure. Other options are patterned cover pages, different colours for each worksheet (perhaps an alternating pattern), whatever you like! I recommend you organize your worksheets using a simple binder and hole punch your pages instead of stapling them. 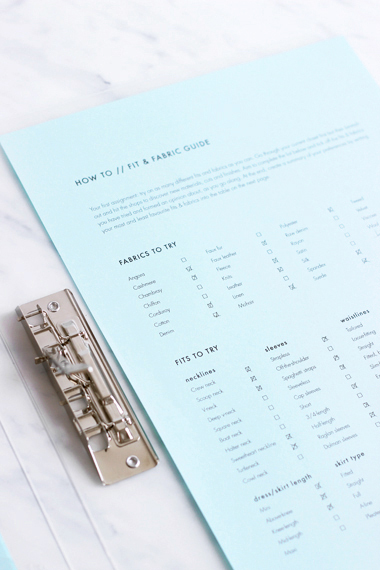 That way you can easily insert or take out additional pages when you need to without too much effort. When choosing a binder, go for one that could accomodate extra pages, so you can freely expand your inventory and outfit catalogue, collect in-progress drafts and keep additional notes. If you like you can also add one of those binder pocket inserts, to store loose pages and reference material. On top of choosing your paper and binder, the workbook itself also provides lots of opportunities to get creative. Make sure you have these things on hand, while working through the pages: pencils and erasers, coloured pens, a ruler (for sketching things), sticky notes, a notepad, extra printing paper in case you need to redo a page or need more space for your answers and a camera. You'll also need access to a photo printer for printing inspiration material and outfit photos for your catalogue.